The Urban Studies Initiative was launched under the directorship of Professor Clyde Woods in 2007 and continued through 2012. The Initiative led to the founding of the journal Kalfou: A Journal of Comparative and Relational Ethnic Studies. Race, Place, and Power was a yearlong series of classes, forums, presentations, and discussions aimed at evaluating emerging concepts, theories, and policies about race and space. These lectures and presentations fell in the areas of urban renewal, historical sociology, cultural geographies, race relations, public policy, art, and social change. Life and Expressive Culture in Los Angeles: In Summer 2007, Professor Woods received a Cultural and Enrichment Program Grant from the Office of Instructional Development to study and showcase Life and Expressive Culture in Los Angeles. The activities, speakers, and symposia brought intellectual engagement and cultural programming for the Summer session, the campus, and the community at large. The research aspect of the project enhanced our new emphasis in urban studies and public policy, bringing the conversation about urban restructuration and inequality to the forefront of our agenda. Domesticity, Affect, Intimacy, Power, and Justice: This third ethnic studies conference in a series was organized by Professor George Lipsitz and took place in October 2008. The conference staged an intercampus and interdisciplinary conversation about the ways in which sentiment, fear, anger, and love function as social and political forces. The dialogue featured intergenerational and interracial perspectives, and several speakers addressed the crucial roles played by gender and sexual normativity in shaping the social and cultural ecology of neo-liberalism. Black California Dreamin’ Symposium and book On May 13, 2011, the Center hosted a conference and workshop at UCSB spearheaded by Professor Clyde Woods. The purposes of this project were (1) To investigate the central role African Americans have played in transforming their communities, the state and the nation during the last three decades; 2) To document the origins of the multiple crises currently facing African American communities; 3) To examine the impact of the current economic crisis and the emergence of new conditions, policies, communities, organizations, institutions, social movements, and cultural practices and movements; and 4) To identify solutions to the crisis emerging throughout the state. From the conference, a book and internet project were designed to critically examine the multiple challenges faced by Black individuals, families, and communities as a result of the global economic downturn of 2008 and the subsequent state fiscal crises. Black California Dreamin’: The Crises of California’s African-American Communities, was released in print and online forms in summer 2012. The volume was conceived by former Center director Clyde Woods, and completed and co-edited by Ingrid Banks, Gaye Johnson, George Lipsitz, Ula Taylor and Daniel Widener. This peer-reviewed book contains original articles about Blacks in San Jose during the Great Migration, Black businesses, urban renewal and social protest in San Francisco, and mortgage foreclosures, the school to prison pipeline, expressive culture, homelessness, and demographic changes in Los Angeles. Clyde Woods, Development Drowned and Reborn: The Blues and Bourbon Restoration in Post-Katrina New Orleans,edited by Laura Pulido and Jordan Camp (Athens: University of Georgia Press, 2017). This book manuscript contains the ideas, evidence, and analysis that Woods developed in his role as Center director. Daniel Fischlin, Ajay Heble, and George Lipsitz, The Fierce Urgency of Now: Improvisation, Rights and the Ethics of Cocreation (Durham, NC: Duke University Press, 2013). Two chapters emanated in the Center’s urban studies initiative, especially its sponsorship of presentations by New Orleans spoken word artist Sunni Patterson in Washington, DC in 2009 and in Santa Barbara in 2010. George Lipsitz, “Afterword: The Black Body as Proof: Black Heroism in the Transatlantic Imagination,” in Celeste-Marie Bernier, Characters of Blood: Black Heroism in the Transatlantic Imagination (University of Virginia Press, 2012), pp. 361–373. This afterword grew out of the appearance by Bernier hosted by the Center in 2010. Gaye Johnson, Spaces of Conflict, Sounds of Solidarity: Music, Race and Spatial Entitlement in Los Angeles (Berkeley: University of California Press, 2013). This book stems from Johnson’s involvement in the Center’s Black California initiative and her earlier participation as a dissertation fellow at the Center. The Center’s Race and Technology (RT) Initiative was officially launched in 2003–2004. It strove to expand and further develop cutting-edge research and scholarship around these compelling and important areas of new knowledge production. 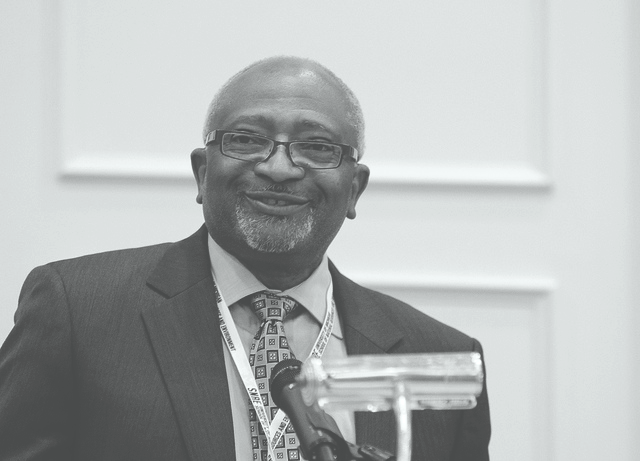 A key component of the RT program was a new interdisciplinary conference that focused on issues of technology access, literacy, and adoption among underserved African Diasporic communities. On May 7–8, 2004, the Center for Black Studies convened the first AfroGEEKS conference, “AfroGEEKS: From Technophobia to Technophilia.” This attracted over 150 prominent scholars, scientists, students, entrepreneurs, artists, and activists over the two days of the conference’s duration. The Center for Black Studies’ Race and Technology Initiative (RT), which featured the AfroGEEKS conference, Among the leading academics, artists, grassroots community activists, entrepreneurs, and scientists sharing their work at the conference were: computer engineer Charles Harper (Sierra Monolithics CEO), new media artist Floyd Webb (e22 digital studios), community activist Anita Brown (Black Geeks Online), professor and filmmaker Carroll Parrott Blue (San Diego State University), poet and activist Kalamu ya Salaam (E-Drum), professor Juan Gilbert (Auburn University), professor Anna Beatrice Scott (UC Riverside), IT specialist Art McGee (Amnesty International), professor Eric Pierson (University of San Diego), professor Raiford Guins (Bristol, England), filmmaker Arthur Jafa, professor S. Craig Watkins (University of Texas-Austin), Ph.D. candidate Fenobia I. Dallas, professor and filmmaker Renee Green (UCSB), businessman James Fugate (EsoWan Books), journalist Greg Tate (Village Voice) and professor Kara Keeling (University of North Carolina), among many others. Based upon the success of the first conference, the Center attracted major funding from the Ford Foundation for the second AfroGEEKS conference, titled “AfroGEEKS: Global Blackness and the Digital Public Sphere” on May 19–21, 2005. AfroGEEKS 2 was distinguished by its focus on technology issues in Africa; it was our primary goals of bringing in significant numbers of IT scholars, activists, artists and other IT workers from developing countries in Africa that interested the Ford Foundation in our grant proposal. The funding from Ford enabled us to bring in people from several developing African nations including Uganda, Ghana, and Sao Tome. UCSB funding enabled us to bring additional African Diasporic and other IT workers from Australia and South Africa. Other participants came from as far away as Australia, Hawaii, Canada, Britain, and across the U.S. The international diversity represented at AfroGEEKS 2 was striking and productive. Among the outcomes of these two conferences was a scholarly anthology featuring seventeen essays from conference participants. 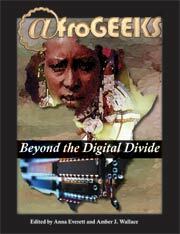 Edited by Anna Everett and Amber Wallace, AfroGEEKS: Beyond the Digital Divide included work on the digital divide, the importance of the internet and virtual communities, technology and art, connectivity and the diaspora, representation in computer and other technology related sciences, and globalization and modernization. The book included an interactive DVD featuring clips from speakers, presentation information, and embedded documents from the second AfroGEEKS conference as well as additional resources. The Race and Technology Initiative also led to the creation of a new journal. Edited by former Center director Anna Everett, Screening Noir: A Journal of Black Film, Television and New Media Cultureproduced three issues between 2007 and 2009.